I was going to say that this post would wrap up my Canada trip, but then I realized that I began posting about this trip achronologically because I completely skipped the beginning! But I'll get there, I'll get there. So this is the end of our trip. Because Patrick had his own vehicle to drive back down to Utah, Josie rode with him to give him some company. My kids and I rode with my mom. We caravanned down to Ucon, Idaho, where our vehicle stopped to spend the night (Patrick and Josie drove the rest of the way home). The drive was fairly uneventful, aside from a pretty spectacular rainstorm through Monida Pass (I think that's where it was, anyway). It was fun to get to see Burt and Kathi's new home and to visit with them for a bit. Kathi made us pancakes in the morning, which the girls really enjoyed. Burt's father is my grandfather's cousin, which makes Burt and my mother second cousins, which makes me second cousins once removed with Burt, which makes my children second cousins twice removed to Burt (I'm pretty sure). As my mom's cousin Lavon (who is my children's first cousin twice removed) said, "It doesn't matter how we're related. We're family!" I agree that it doesn't matter how we're related (though it sure is interesting to figure it out) because often how closely you feel related has to do more with time invested in a relationship than it does in bloodlines. 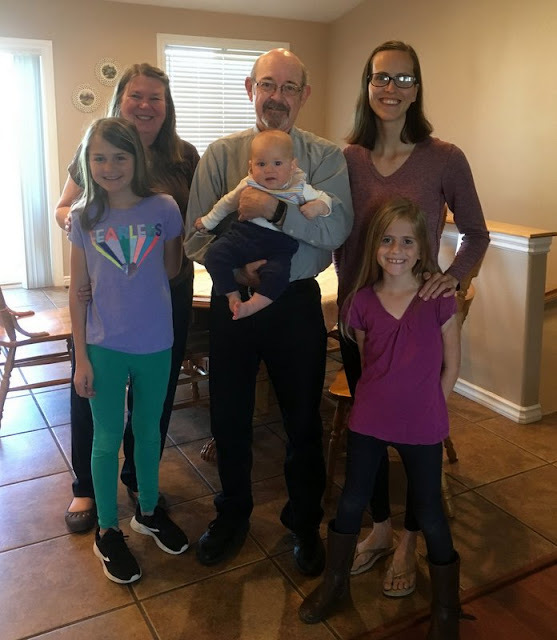 My grandpa and Burt's father were very close cousin/friends, so their children grew up feeling more like cousins (rather than more distant second cousins) so, you see, it doesn't matter how we're related; we're family. I had quite the time wrestling the pack'n'play closed. Sometimes it's a breeze to fold up and other times I just cannot do it! I tried and tried and tried but could not get the thing to collapse, so I finally pulled out the instruction manual so I could reread it to find the trick. Miriam, who'd vacated the room by this point, wandered back in to see how I was doing. And then she started chatting. She prattled on about everything under the sun and was, to be honest, a little distracting, which was making me feel frustrating. But, like, you want your children to talk to you, right? And we were on vacation so I should be laid back, right, and just let her talk? Well, I finally figured out the problem and the pack'n'play finally lived up to the first half of its name and packed up for me. "Hallelujah!" I said. "I did it!" "Oh, good," Miriam chirped, skipping away mid-story. "I just wanted to make sure you could do it!" If only I had known she was chatting to me out of pity—her way of offering moral support—I could have probably told her to clear out without offending her! It was lovely to get a few minutes to listen to her, though, even if it made my task a little more frustrating. 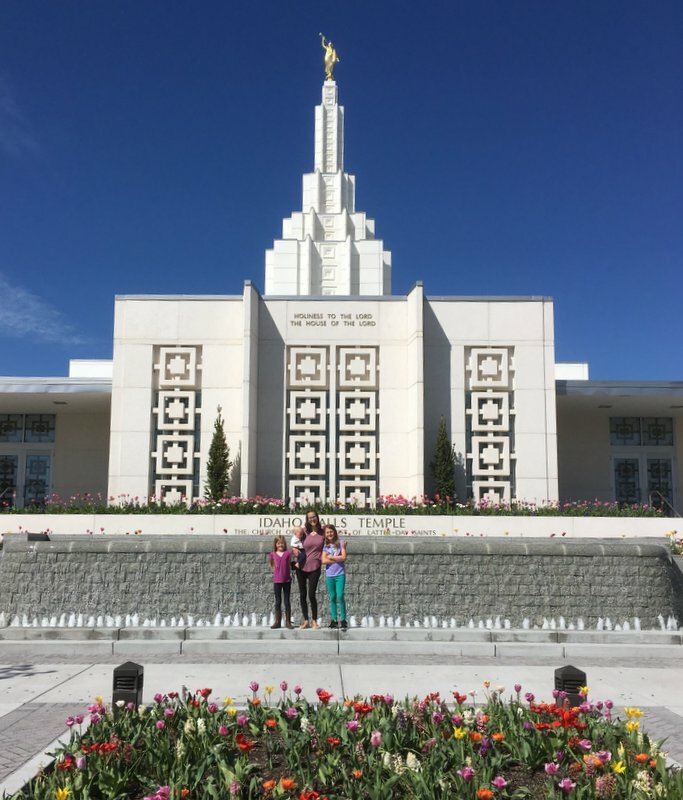 The next stop on our itinerary was a visit to Auntie Emily and her family, but we had to wait for her to be finished teaching so we stopped by the Idaho Falls temple on our way to Emily's house. We enjoyed the temple grounds as well as a bit of the river walk. Auntie Josie had given each of the girls a disposable camera at the beginning of the trip and it took them awhile to figure out. Using the viewfinder to set up the shot, having to wind the film before taking each picture, remembering that they have to be selective about taking pictures because they only have a limited number to take (I suppose digital cameras do as well, but the limit is in the hundreds (even thousands) rather than, like, 27). They had fun walking around the temple grounds together while I fed Alexander in the van and my mom kept me company. It will be interesting to see how their pictures turn out! It was so good to see Emily and Morgan and their kids again. 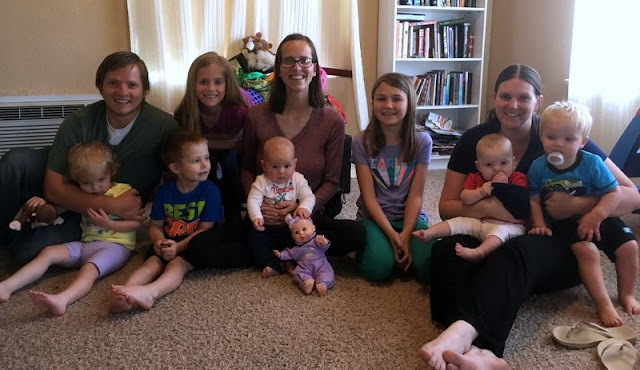 The kids, of course, wished that Benjamin and Zoë had come with us, but I think Gavin had fun playing Mario Kart with boring old Rachel and Miriam while the grown ups visited. We didn't stay (couldn't stay) long and were soon back on the road, heading back for real life. Or, you know, at least a couple days of real life before I headed off on another trip. Oy, vey! Behold! The gender neutral bathroom!